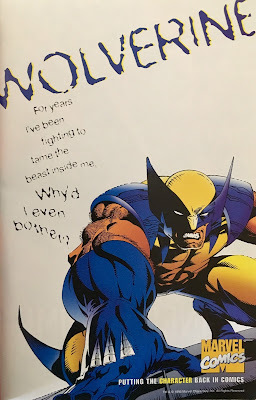 Growing up there were a handful of consistent "battles". Different brands facing off for the consumer's dollar... 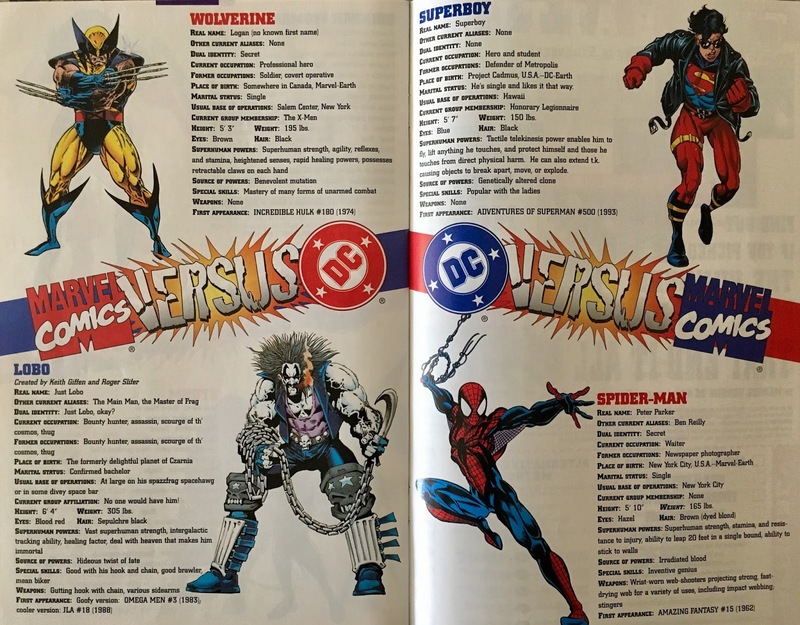 I'm talking about McDonald's versus Burger King... Coke versus Pepsi... WWF versus WCW... Disney versus Warner Bros. (heyyy)... and of course, Marvel versus DC Comics. 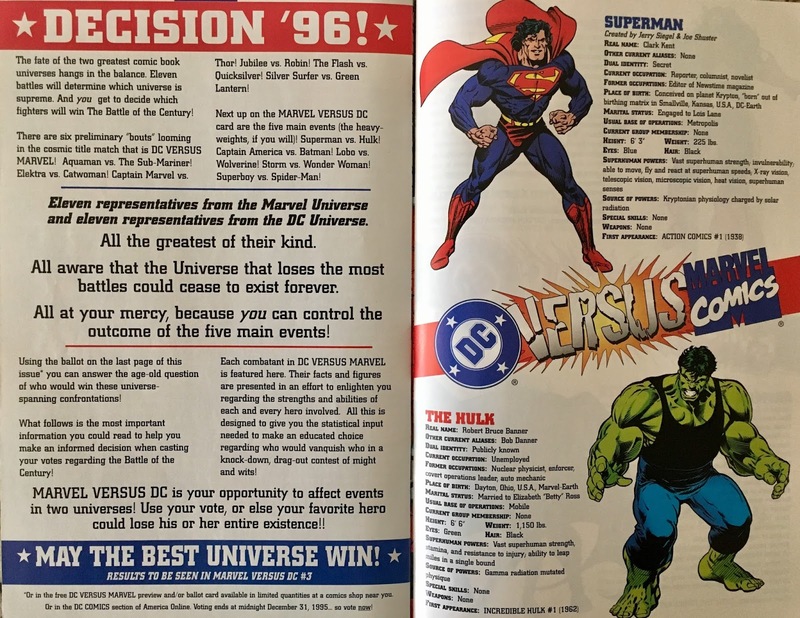 When it was announced that Marvel and DC would have some knock-down drag-out event, many of us raised an eyebrow. Our (or at least, my) curiosity was piqued... and then they announced the voting gimmick. Yuck. Right then and there, I lost complete interest in the event... figuring that this will be 90% gimmick to 10% story. 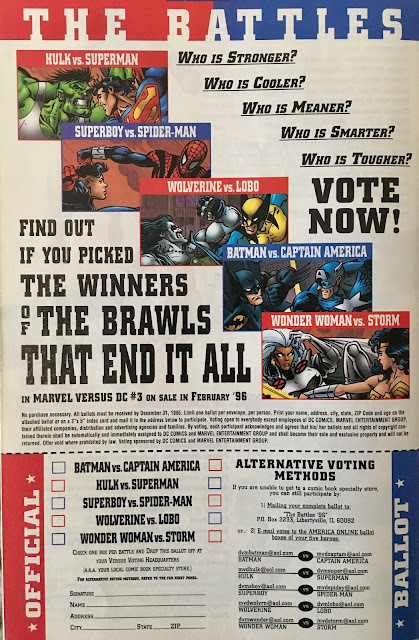 Thinking back, the only good thing about the ballot gimmick is my memories of comics enthusiasts arguing about how these fights would've panned out... had they occurred in "real life". 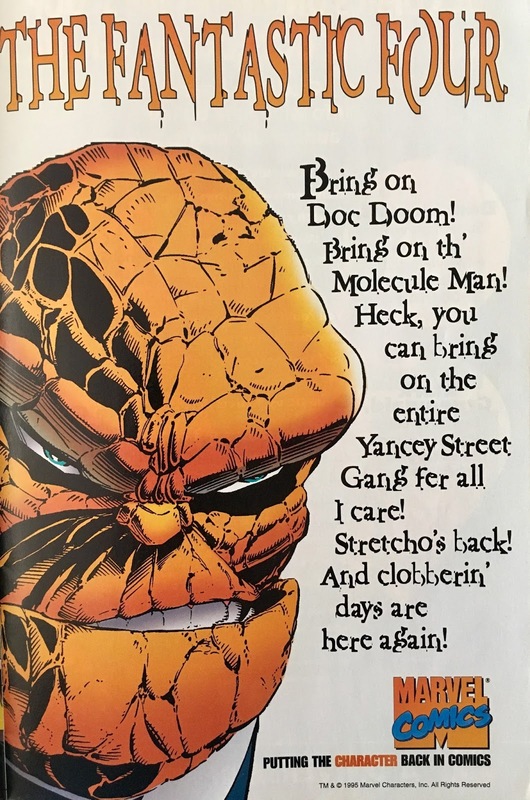 Ay yai yai. While I'm thinking of it... 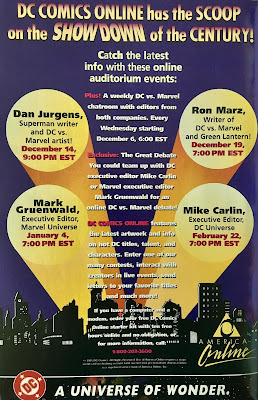 I also really dug the rumor that Marvel and DC were going to trade a character for a year. 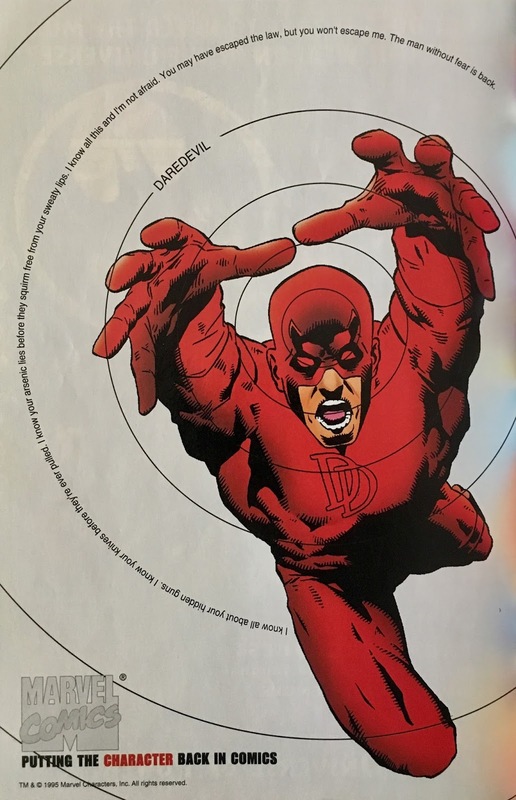 Scuttlebutt was that Daredevil was heading to DC in exchange for Catwoman. Imagine if that actually came to pass! 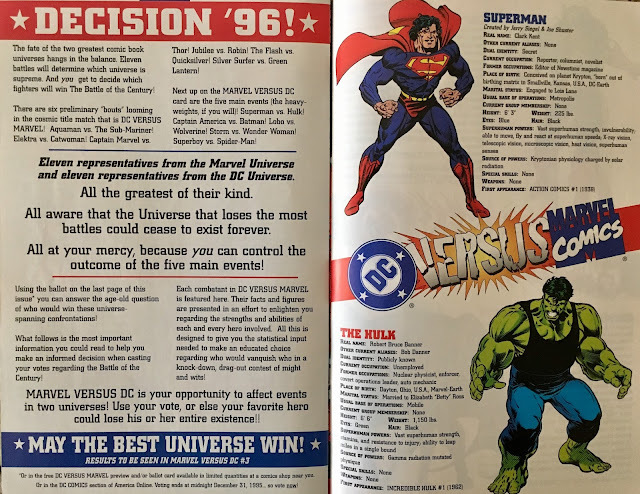 Well, with that ringing endorsement out of the way... let's celebrate our SIX-HUNDRED FIFTIETH daily discussion with Part One of the landmark event... DC versus Marvel (or if you prefer, Marvel versus DC). 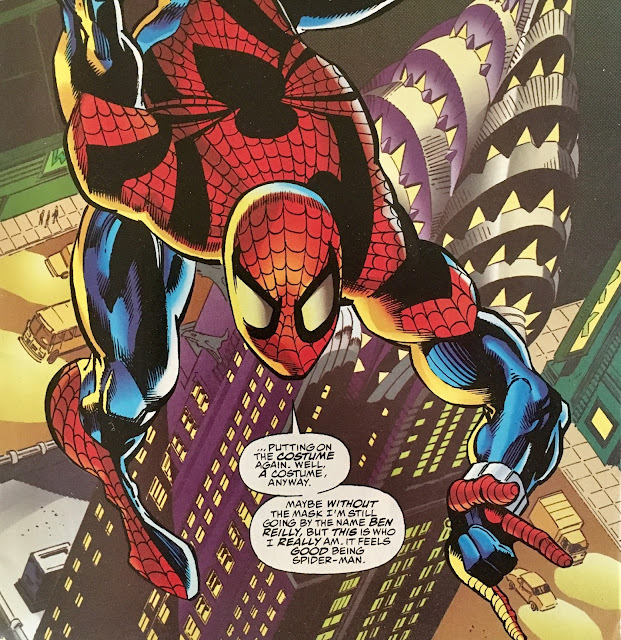 We open our story with Spider-Man... that is, Ben Reilly. He's swinging through the sky above Manhattan, talking to himself about just how much he loves... Manhattan, and... ya know, having his life back. Clone Saga, don'tchaknow. His monologue is interrupted by the tingling of that pesky Spider-sense... which draws his attention to a strange glowing box in an alley. 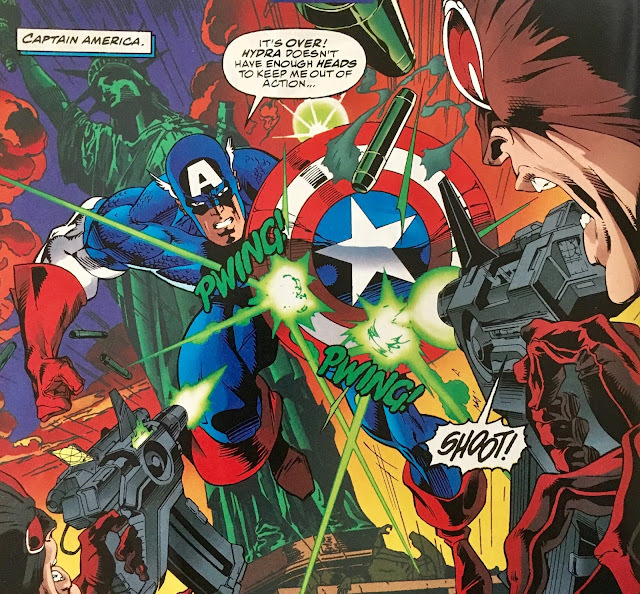 Now we're not talking Cosmic Cube here... it's really more like a radioactive refrigerator box. 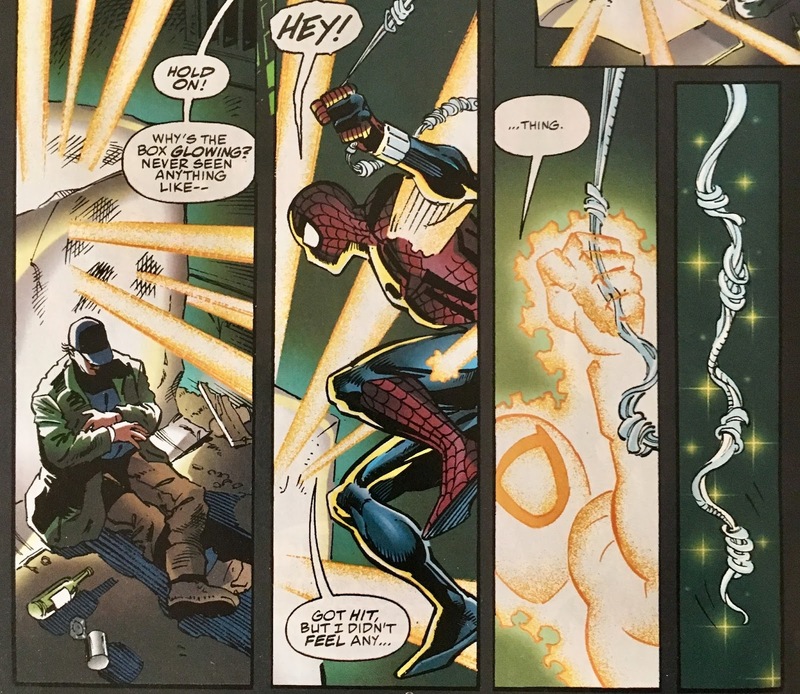 As he approaches, the box triggers something in Spidey causing him to vanish. 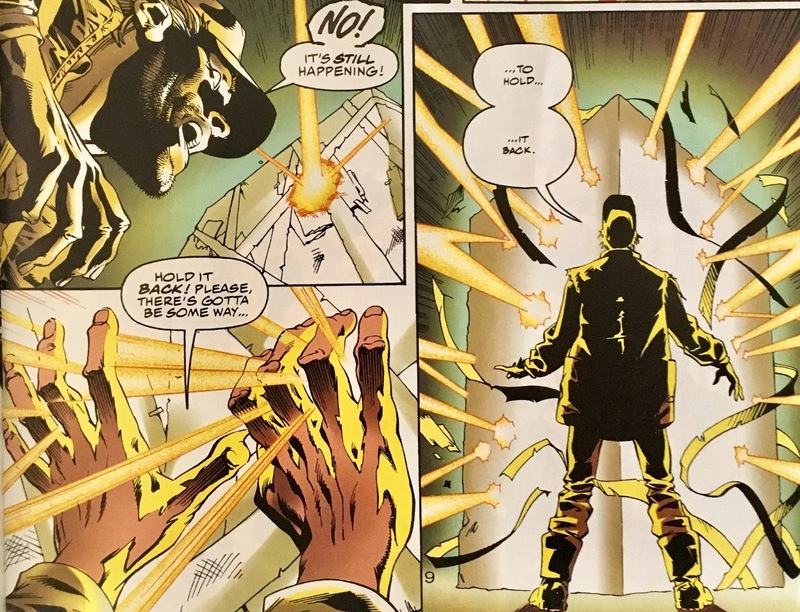 He reappears... in Gotham City! Right in front of the Joker, no less! 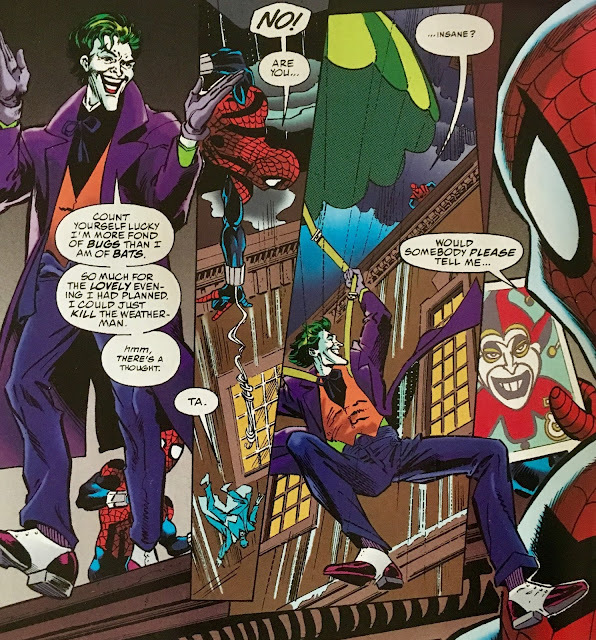 Spidey's pretty dumbfounded (he doesn't even know what a "Gotham" is), while Joker seems to have a vague memory of having tangled with Spidey before... though, one that wore a different costume. Ben doesn't quite follow... because that was a Peter story. Back in Westchester County, 616 Universe... X-Men members Gambit, Storm, and (bone-clawed) Wolverine do battle with the unstoppable Juggernaut. Just as Marko is about to put a pounding on Wolvie's face, he blinks out of reality... and winds up outside the Daily Planet Building in Metropolis. He gets socked by Superman-on-the-spot. Back in 616 Manhattan, that radioactive refrigerator box starts emitting beams of light. The man guarding it looks troubled... and tries to hold it back, but it's to no avail. Next in Gateway City DCU, Wonder Woman saves a whole lotta humanity from a falling bridge... then she vanishes. 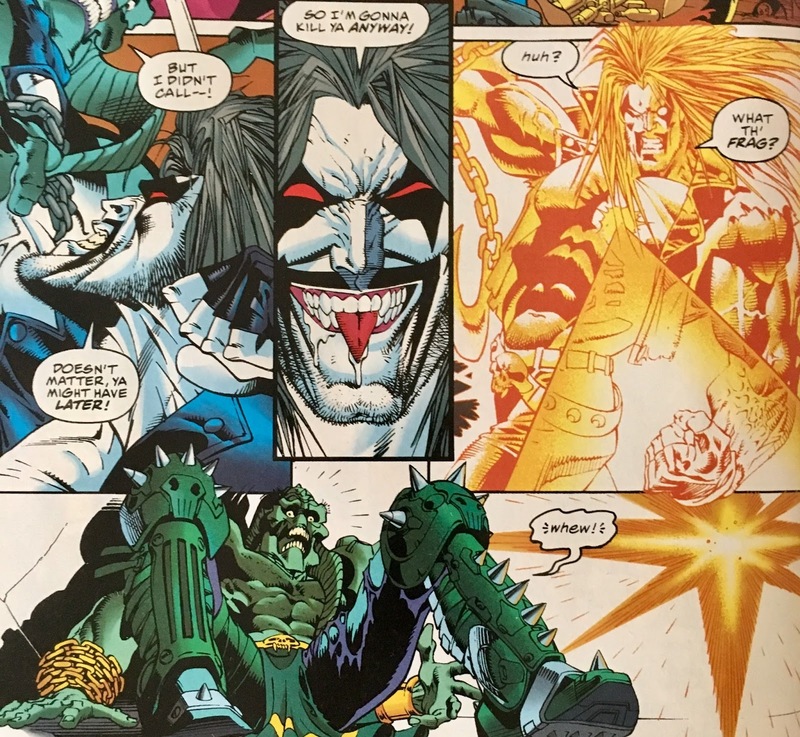 In deep space, Lobo beats up some fraggin' bastiches... then vanishes. 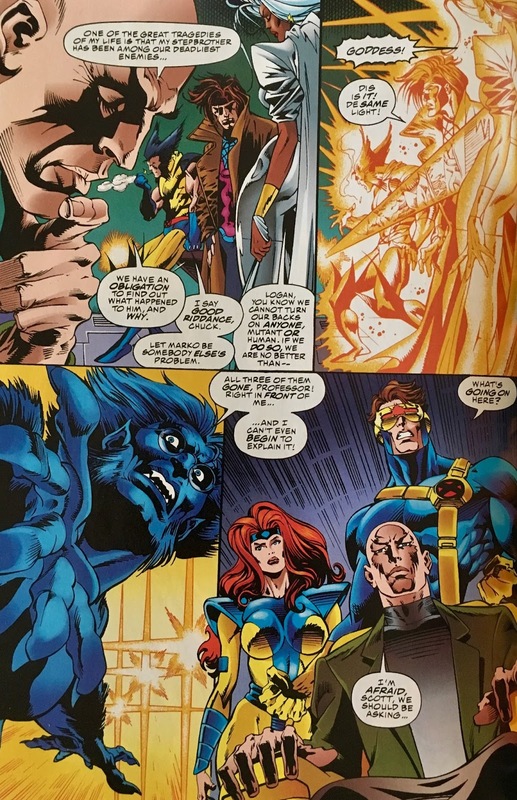 Back in Westchester, the X-Men try to explain what just happened to the Juggernaut. While Professor X strains his brain, that glowing light surrounds Wolverine, Gambit and Storm... and they vanish! We get a pair of pages showing the various Marvel and DC characters as they get hammered by the vanishy light, before settling in at the Batcave, where Bullseye is holding a knife to Robin's throat. 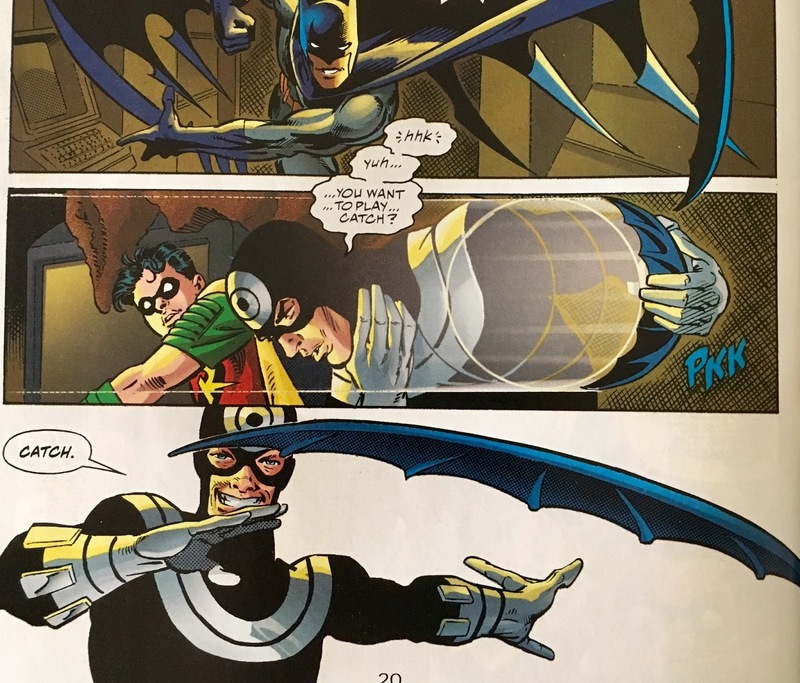 This is actually a really good scene... Batman hurls a 'rang at Bullseye, who catches it and sends it back! 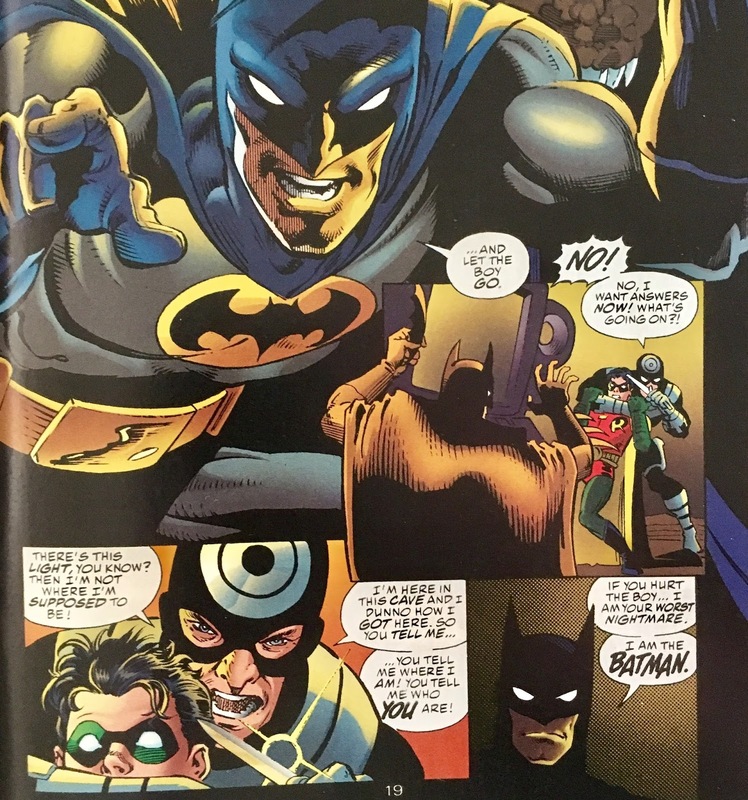 Batman ducks the returning-'rang, and manages to kayo the baddie. 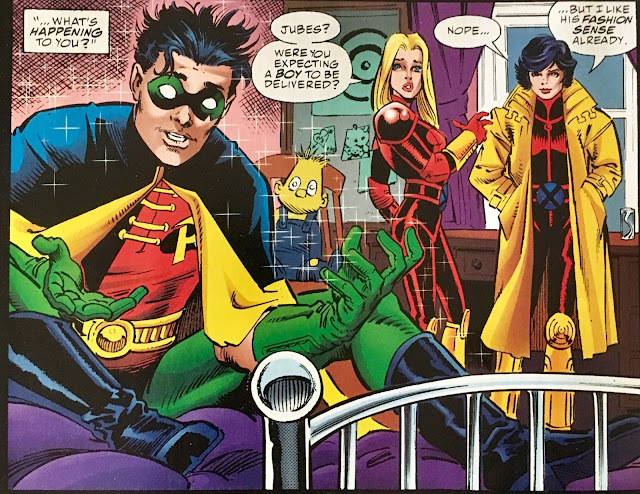 When the dust settles, Robin begins to glow... then vanishes! He reappears at the Massachusetts Institute that Generation X calls home. We return to Metropolis... whose skyline is now home to both The Daily Planet Building... and Four Freedoms Plaza. 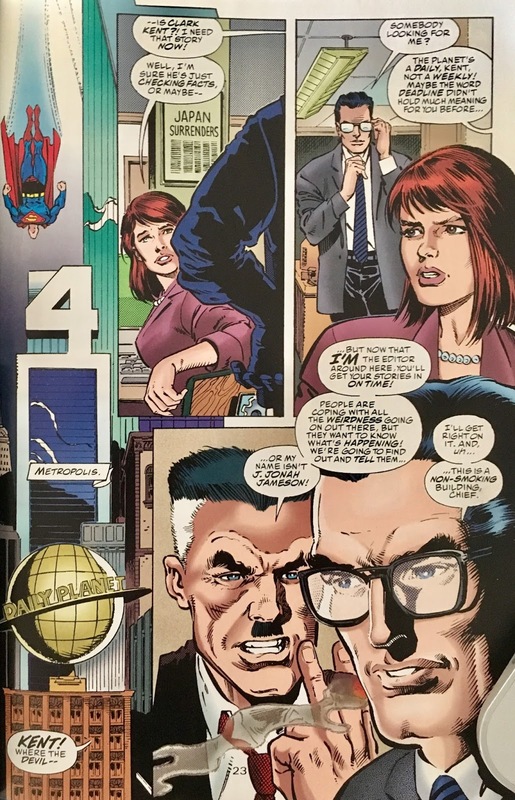 Clark Kent arrives at work in time to meet his new editor... J. Jonah Jameson! Seems the new owner of the Planet forced Perry White out on his keister. 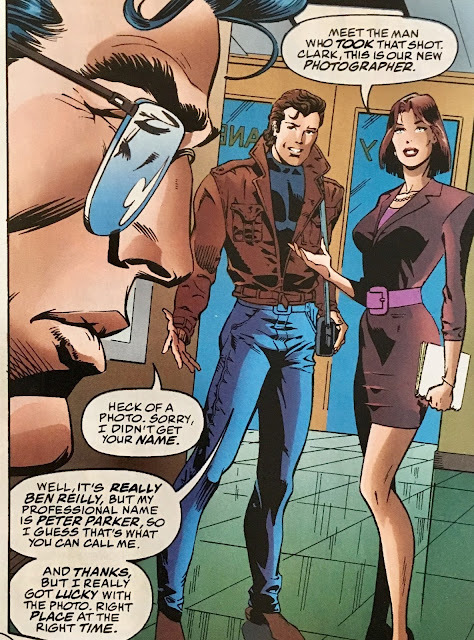 Clark is interrupted by Lois, who introduces him to photographer extraordinaire... Ben Reilly! Well, his professional name is Peter Parker... that sure doesn't make things more confusing, does it? We next jump to a scene of cosmic proportions featuring my favorite sleep-aid, the Spectre! He, along with the Living Tribunal sense that something is amiss. That Spectre, always about twenty-pages too late! We wrap up with a pair of identical (though differently colored) characters... who might just be the cause of all this inter-company hoo-doo. If I had a dime for every "chill" I got while reading this issue... I'd have zero dimes! Okay, I exaggerate... a bit. 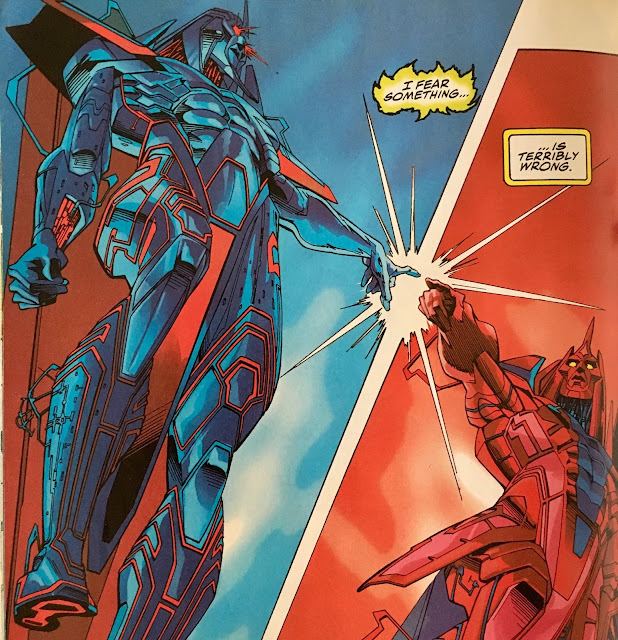 Now it's easy for me to play armchair quarterback some two decades later... but, I feel like this could've been so much more epic had they used the more iconic versions of the characters... or just took the damn thing (completely) out of continuity. 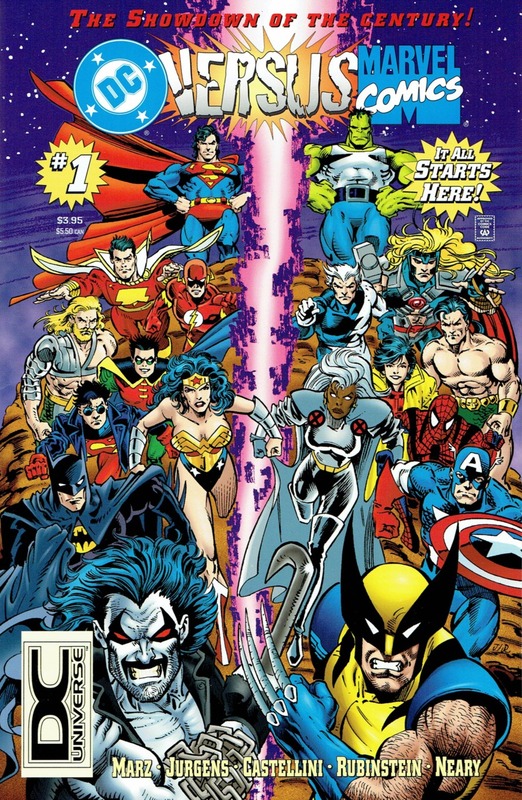 If you ask me, a series like DC versus Marvel/Marvel versus DC should be as evergreen a book as either of the big two put out! 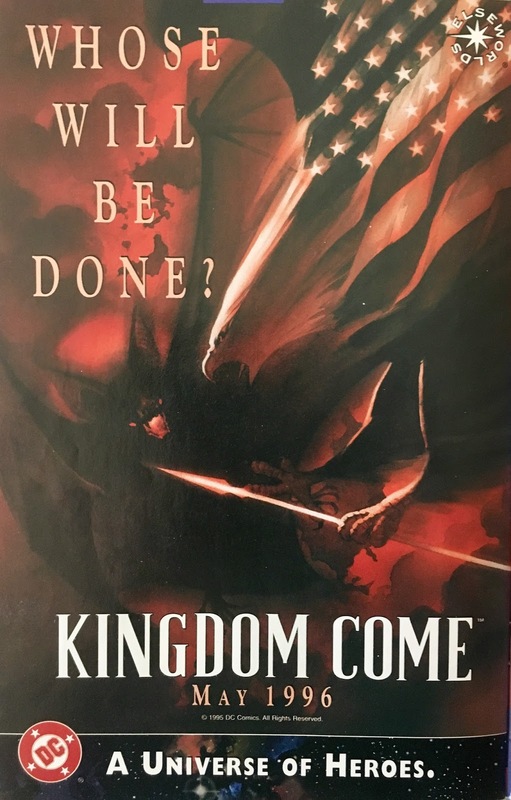 Give this to a "new reader" today, they'd be completely lost! 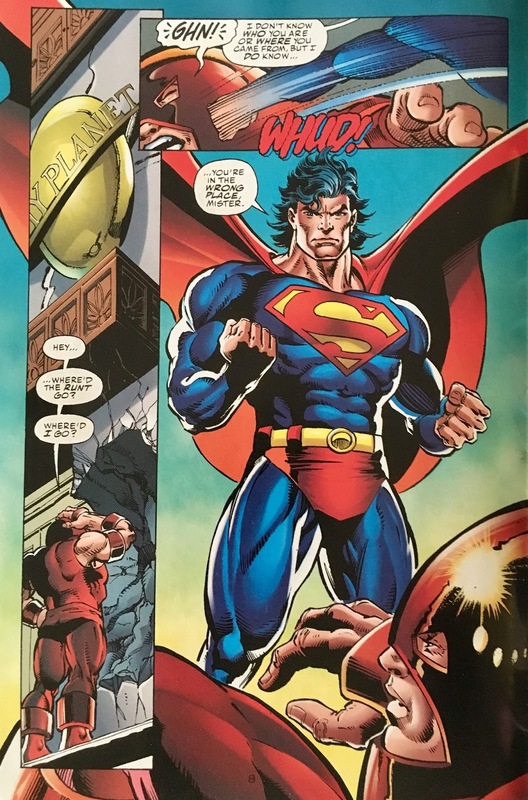 Bone-clawed Wolverine... Ben Reilly Spider-Man... mullet-head Superman... wha--? 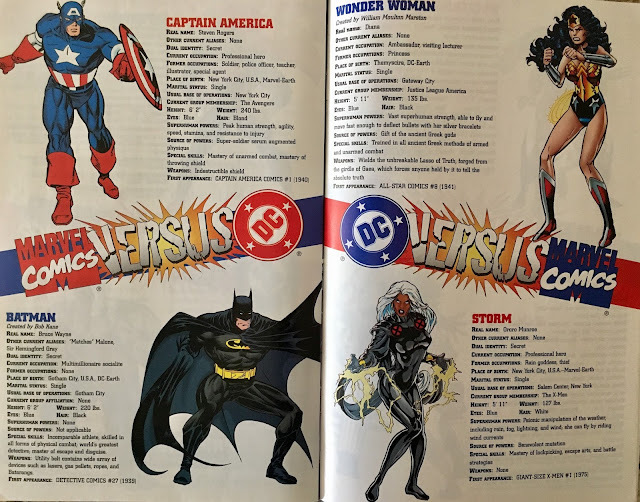 I understand why they used the contemporary characters... which only makes me wonder if there might've been a better time in both companies' history to make an attempt at such an endeavor (speculator bubble bursting be damned). 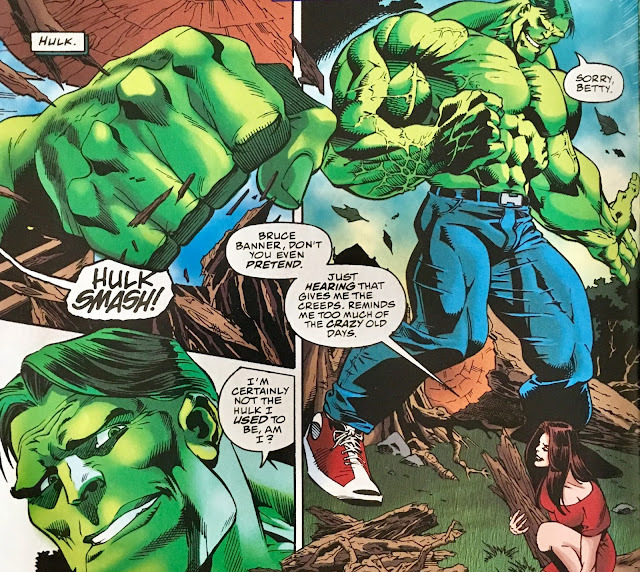 Makes me shudder to think what would've happened if Marvel and DC waited until now to do this... with all of Marvel's forced "substitute" heroes. Yikes! Another thing... for a book of this magnitude, it feels like there should've been more of a story to hang our hats on. 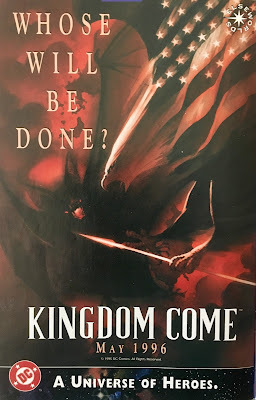 Sure, it's only the first issue... and we still have to wait for the votes to pour in... but, still... this just didn't grab me. 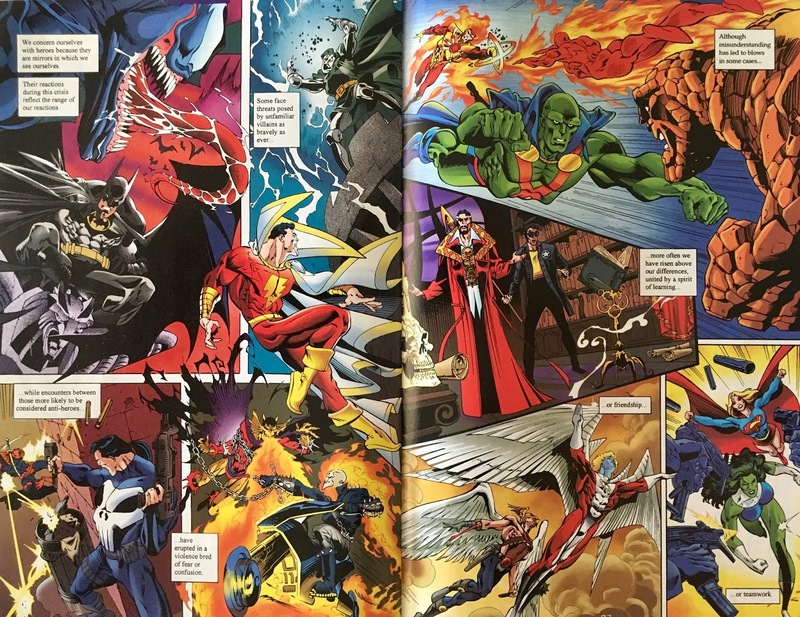 When I first read JLA/Avengers, or Superman vs. the Amazing Spider-Man... hell, even other mid-90's fare like Spider-Man and Batman or Spawn-Batman... there were instant chills and investment right off the bat. This, not so much. This feels more like (if you're a pro-wrestling fan) the WCW Invasion of comics... something that had to happen, but it feels like their heart wasn't really in it. Also, this book needed art which doesn't look sorta rushed. If you flip through this quickly, you might confuse it for an inventory story from an issue of X-Men Unlimited... which, again... is a damn shame. 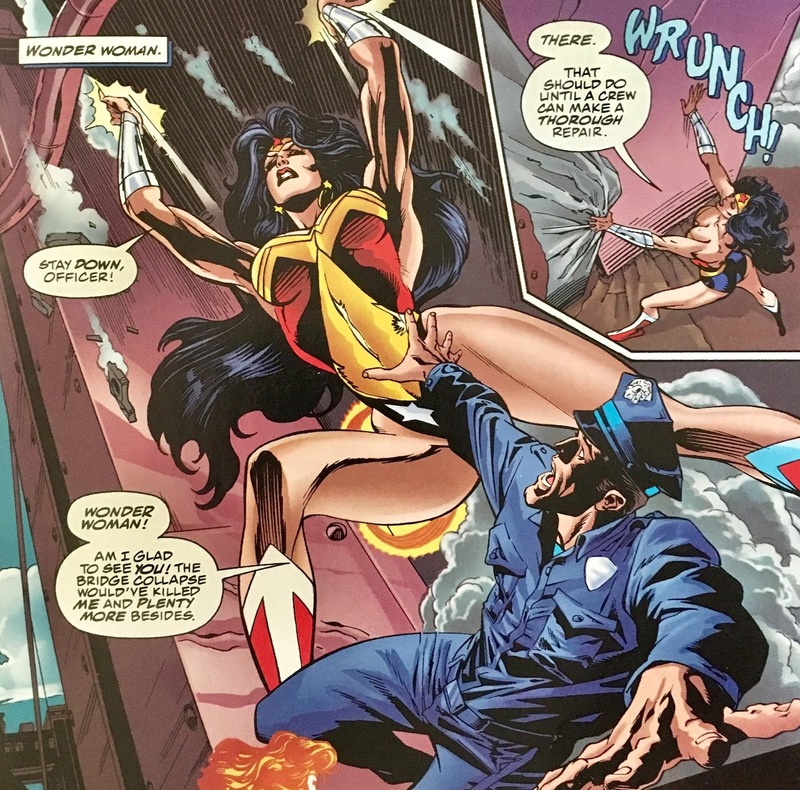 The artists credited here are super talented (Dan Jurgens is one of my absolute faves), but it just doesn't come across here. 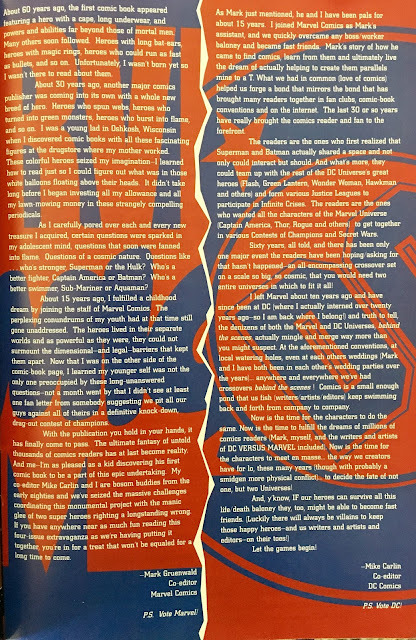 It's not every page (many look pretty spectacular)... but there are a handful of unpleasant ones here. 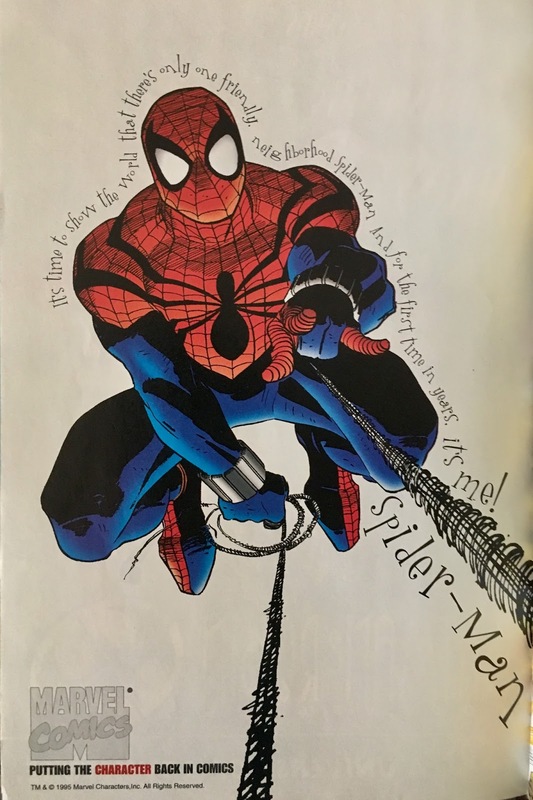 Maybe it's the inking... maybe it's that rotten mid-90's blistery-glossy paper... maybe the series was just something they were trying to "fit in" to schedules. I dunno. It just doesn't feel like it was a "passion project" to anybody... and a story of this magnitude almost needs to be. Overall... as a curiosity, this is worth flipping through.